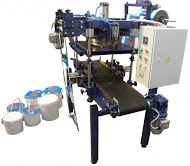 Bucket sealing machine (trays, cups) - SKB "Parus"
Machine is designed for hermetic packing of products and fluids. Machine seals the polymer film to the polymer buckets, trays, cups, etс. Machine is equipped contour cutting systems and automatic film rewind, the adjustment mode sealing. Equipped with a product locking system during sealing.